Originally published as 450 Years of Chicano History in Pictures / 450 Años del Pueblo Chicano in 1976 in response to the 1776 Bicentennial celebration of the American Revolution and its lies, this newer edition was published in response to the Quincentennial celebration of Columbus’s arrival and its lies. The road is yours, people. 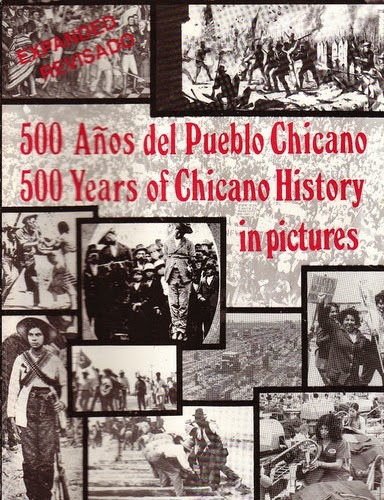 Containing hundreds of photos, paintings, drawings, political cartoons, and text in Spanish and English about truths long denied, 500 Años is a huge photoessay, both a rare and valuable collection and a family album, about the Mestizo people in whom Indian blood runs strong, in whose blood runs the cry for freedom. There is much to celebrate, Martinez writes: the survival of the people and the resistance to exploitation, colonization and assimilation; the particular strength of Raza women in the face of discrimination and oppression; the great love, determination and fighting spirit of the elders; and the children who are the future. The struggle for tierra, paz y libertad is to be celebrated, as Martinez writes, “as all of humanity’s great stories of struggle.” It’s a story still being written. An excellent teacher-friendly guide, written by Judy Zalazar Drummond, is also available. Both books are highly recommended. If one thing can be said of Betita Martinez in particular and Chicanas as a group, it’s this: They’re no wimps. 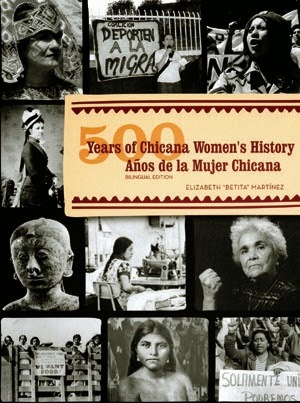 And 500 Years of Chicana Women’s History/500 Años de la Mujer Chicana is proof. It’s a family photo album spanning more than 500 years, filled with some 700 photographs, drawings by Rini Templeton, political cartoons, newspaper clippings and short biographies, in Spanish and English, that highlight the histories and struggles of the women who now call themselves Chicana. This giant compendium of female resistance—a companion to Martinez’s earlier work, 500 Años del Pueblo Chicano/500 Years of Chicano History in Pictures—includes many names and photos some will recognize, such as United Farm Workers co-founder Dolores Huerta, writers Sandra Cisneros and Gloria Anzaldúa, visual artist Carmen Lomas Garza, and the bullet-belted, rifle-toting guerrilleras of the Mexican Revolution. But here are also stories of the Native women who rebelled against colonialism: the Aztec women who “rained down darts and stones” on the invading Spaniards; Toypurina, who led a revolt against slave labor in the San Gabriel Mission; the women who led the 1692 “corn riot,” during which they burned down the viceroy’s palace and the mayor’s office. And stories of the Mexicanas who fought and died in the War of Independence and Mexicanas who came to the conquered northern territories, surviving a hard life, bringing with them the legacy of resistance. Here are Chicana healers and midwives, migrant workers, cannery workers, laundry workers, garment workers, union activists, anarchists and communists, feminists and lesbian activists, Brown Berets, Raza Unida and other community organizers, storytellers, artists, students and teachers—individually and collectively fighting war and racism and continuing to sabotage the empire. Although Betita Martinez pays tribute to the many whose stories are here and the many who helped put this book together, she herself is a national treasure, no, an international treasure. ¡Gracias por todos, Betita! Highly recommended. This review first appeared in MultiCultural Review. We thank Editor-in-Chief Lyn Miller-Lachmann for permission.